Acid Phosphatase 5, Tartrate Resistant, Tartrate-Resistant Acid ATPase, Human Purple Acid Phosphatase, EC 3.1. 3.2, TrATPase, Tartrate-Resistant Acid Phosphatase Type 5, Tartrate-Resistant Acid Phosphatase 5a, Tartrate-Resistant Acid Phosphatase 5b, Tartrate-Resistant Acid Phosphatase, Type 5 Acid Phosphatase, TRACP5a, TRACP5b, TR-AP, HPAP, TRAP, ACP5. General Description of Recombinant Human ACP5. 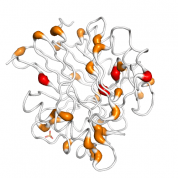 Human ACP5 produced in Sf9 Baculovirus cells is a single, glycosylated polypeptide chain containing 304 amino acids (22-325 AA ) and having a molecular mass of 34.3kDa (Migrates at 28-40kDa on SDS-PAGE under reducing conditions). ACP5 is purified by using an optimized multi-step FPLC method for maximum separation from contaminants. Host: QP10502 protein expressed in Insect. Protein Construction: A cDNA sequence encoding the sequence of ACP5 was constructred and used to recombinantly synthesize the protein. Application Notes: Please contact us for application specific information for QP10502. Bioactivity Data: Specific activity is >10,000 units/mg, and is defined as the amount of enzyme that hydrolyze 1.0 nmoles of p-nitrophenyl phosphate (pNPP) per minute at pH 5.0 at 37°C. Buffer: ACP5 protein solution (0.5 mg/ml) contains Phosphate Buffered Saline (pH 7.4) and 10% glycerol.